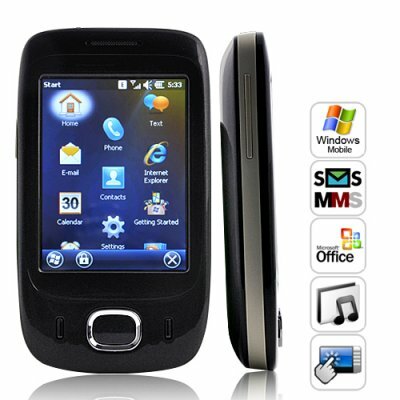 Successfully Added Vision X1 Touch Screen Smartphone with Windows Mobile 6.5 to your Shopping Cart. Pure performance and style merge together to bring you the Vision X1 Touch Screen Smartphone. More than just a communications device, the Vision X1 is a top-of-the-line Windows Mobile 6.5 smartphone that combines the best elements of a touch screen experience with the latest in advanced mobile phone technology. Do whatever you want, when you want. Let your finger flow smoothly over the 2.8" touchscreen and feel the exhilaration of your first touch all over again. The clean interface of the Vision X1 Smartphone combines perfectly with the phone's main functions and making a call has never been more intuitive - or thrilling. The power is in your hand mobile phone. For starters, the Vision X1 Smartphone comes with a powerful IEEE802.11b/g Wi-Fi internet adapter, a highly responsive 2.8 inch touchscreen, and a dynamic Hisilicom K3 processor that makes loading applications, browsing the internet, or navigating the operating system, quick, easy and efficient. Best of all, with everything packed inside a compact and user-friendly design, the world is truly at your fingertips. With the best mobile operating system by your side you can say goodbye to slow and inefficient performance, and say hello to fast, fun, and user intuitive navigation. Windows Mobile 6.5 allows you to access a variety of applications like Google Maps, Skype, Outlook Express, MSN Messenger, and much more through the Windows Marketplace. Choose from hundreds of new games and applications to make the Vision X1 Smartphone exactly the way you like it and truly yours. When it comes to overall value, styling, and performance, it's hard to beat the Vision X1 Smartphone. With so much technology packed into such a slim and compact phone, you basically have a small computer at your hands. Available in our warehouse now, order today and we'll ship it out tomorrow. The Vision X1 Smartphone is brought to you by Chinavasion, the leader in whole electronics and china mobiles. This phone does not have a GPS receiver and does not need software for the GPS function. It uses Quick GPS, which receives data from the internet and calculates where you are. Windows Marketplace app included, download your favorite games and apps! Make free calls with the Skype application and your Wifi connection. Simply visit Skype.com and download the latest mobile version for Windows 6.5. The CVNR-M153 allows users to download and install additional programs that are compatible with the devices OS. Please note that Chinavasion does not provide any customer support or technical support towards user software updates and user installed applications. Windows Mobile 6.5 combines entirely new features with many enhancements to help you stay connected and manage your busy life. From a more intuitive gesture-driven interface (you can tap, drag, click, and pan) to a revamped Start screen, access and navigation are fast and easy. And with the new Microsoft My Phone and Windows Marketplace for Mobile services you can easily back up your data to the web and download great apps. With Windows Mobile 6.5, you can see alerts even if you’re on a call or have password-protected your phone. You’ll see new e-mail and text messages, missed calls and voice-mail notifications, and the date, time, and next calendar appointment. Is this a certified Windows Mobile V6.5 device? Select Start, go to file explorer, at the top where it says my device, click on the my device text and it will drop down to reveal the storage card. How do I copy and paste file from one folder to another? When you select a file, just hold down with the stylus or your finger, you will then be able to copy, cut, paste, rename, delete, send and beam file. Can I download new apps with this Windows Mobile Smartphone? Yes! Windows Marketplace is already built in for you to search for and download a huge list of amazing games and apps. How do can I synchronize my hotmail account with outlook email? When you create and msn account or sign into msn, it will allow you to synchronize your hotmail email address with the outlook or other email that is setup. This way outlook will automatically download your emails from hotmail straight to your brand new window mobile. I keep recommending this site! Excellent service, fast delivery! !